The rain has avoided us again. I’m resigned to settling into a second drought pattern, and I’m resolved to fare this one better than the last. 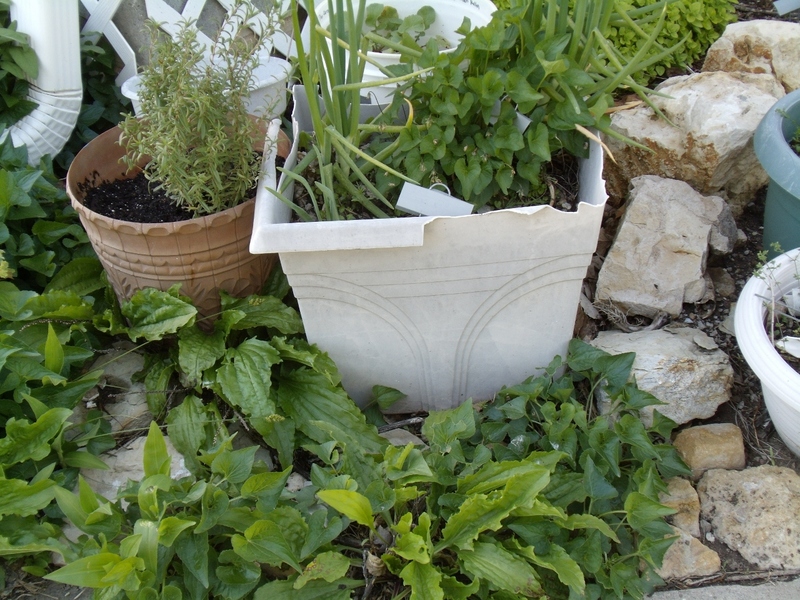 This year, I’ve copied the design of the water trough planter and made a wicking bed planter. It’s doing fairly well, although I believe it’s almost time to move it to a better location. I planted the kale, lettuce, radish and onion here. 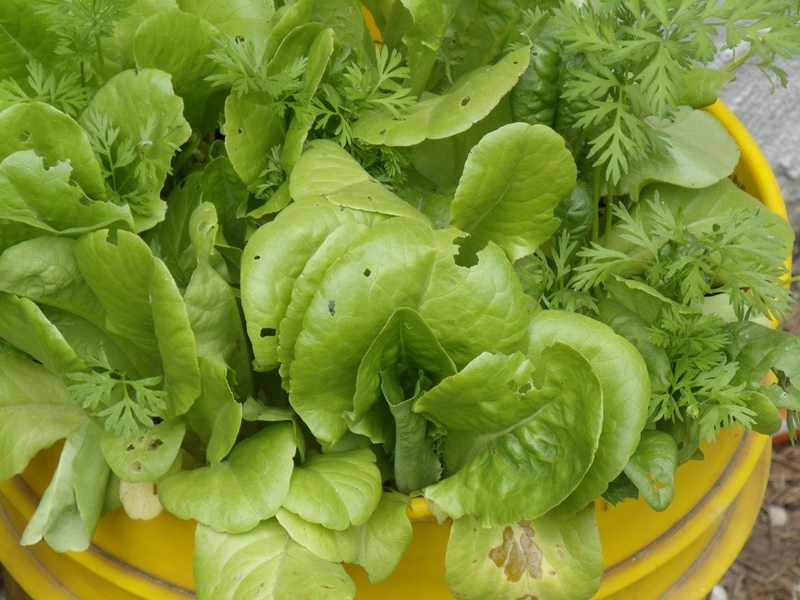 There was a pest attack, so I didn’t get much lettuce harvest. 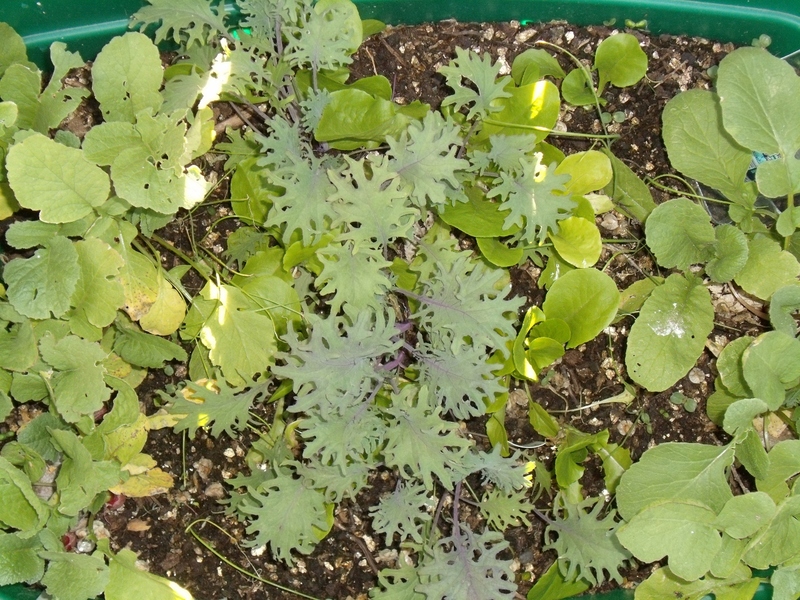 The kale has been a bit reserved in its growth, but I’ve added a few leaves to salads. The onion seeds were planted a month late, so I only expect to have green onions from them. 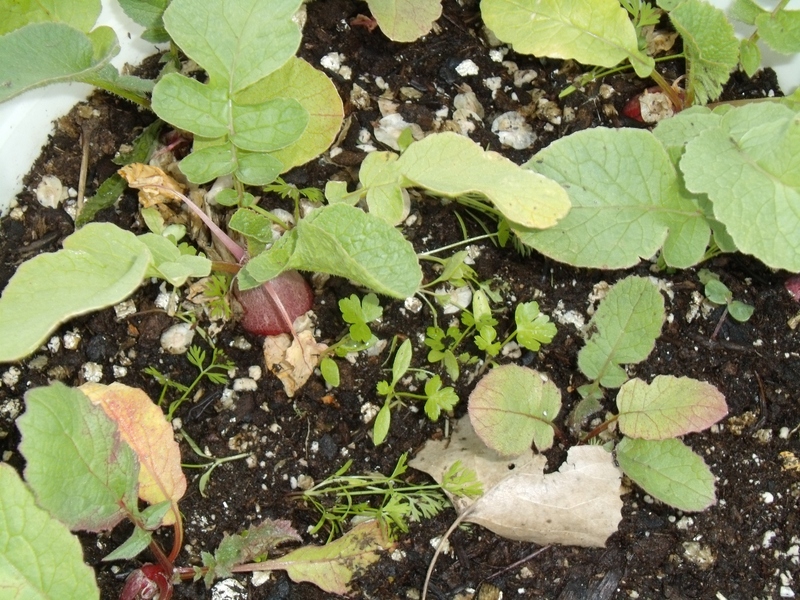 We did enjoy several radishes in salads before I allowed them to go to seed. 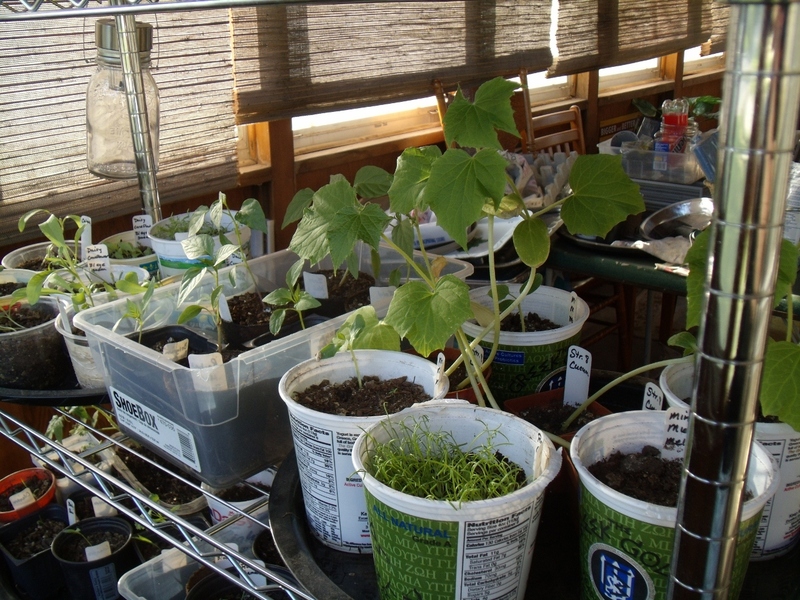 Next time, I’ll set that container right outside during the end of winter with a clear plastic cover. The leaky bucket that I set outdoors during the cold has fared well. 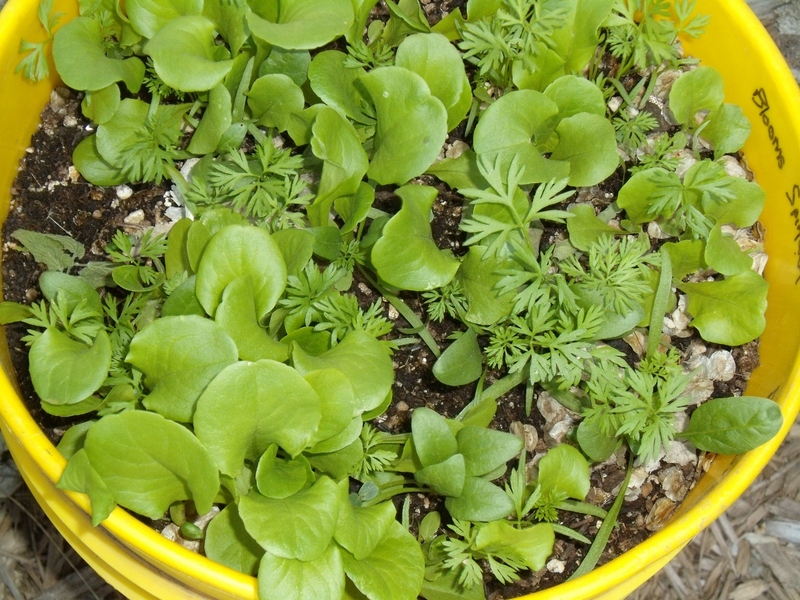 The lettuce has now succumbed to some pesky pest, but the carrots are thriving. This bucket has a water reservoir and overflow, but no fill tube. The first leaky bucket sat too long on the porch before being placed outdoors, plus it is full of soil mix with no water reservoir. The radishes fared well, but the carrots and parsley are still as wimpy as ever. 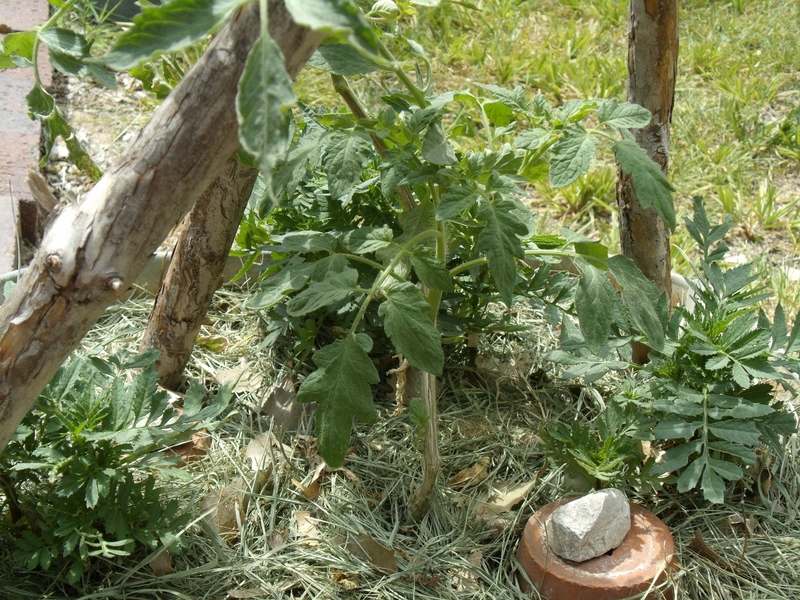 The big win is the holdover from last year, the water trough planter. 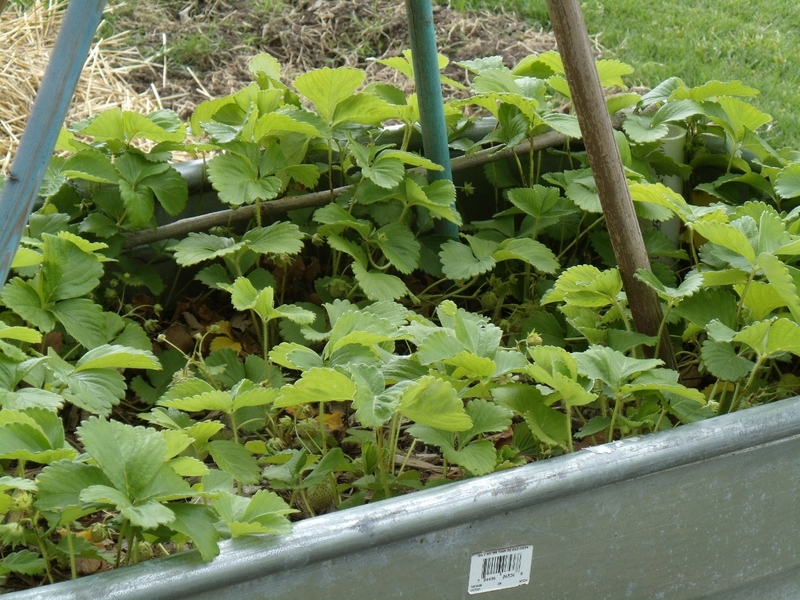 Strawberries have done very well, and I’ve only filled the reservoir once this spring. I did plant a few cucumbers into the bed and only one has survived, barely. 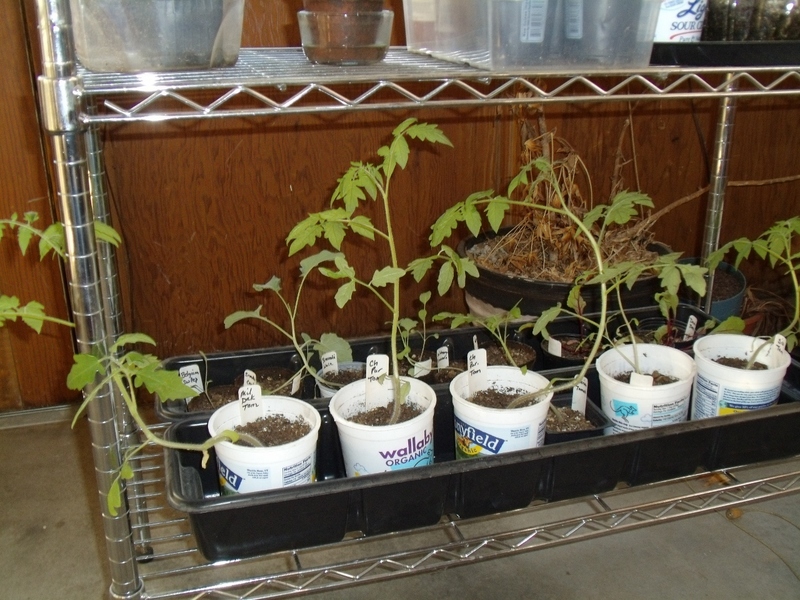 The new stars of the show are the tomato planters with ollas. I fill the ollas once a week, and the planters are set next to a north side patio that gets about eight hours of sun per day. I put two ollas in each metal container, with a basil plant and marigolds to help shade the soil once things really heat up. So far, these are doing extremely well. 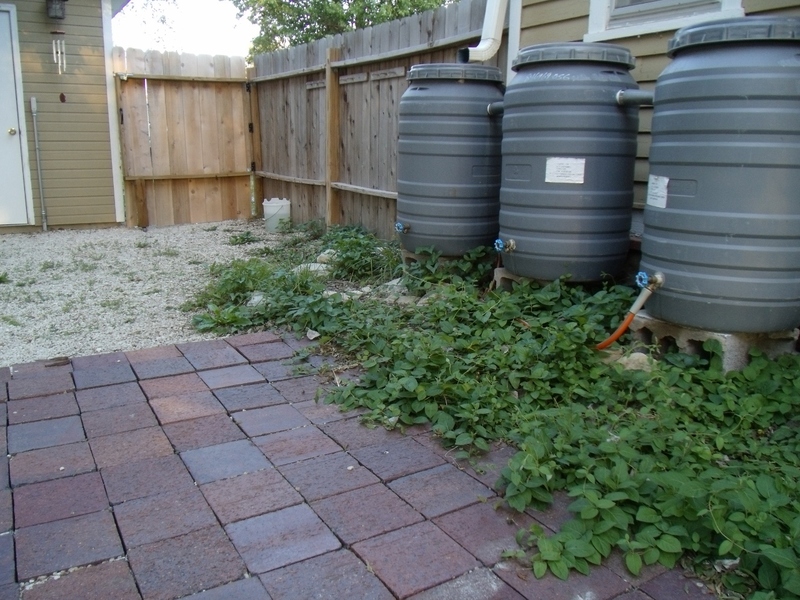 The primary water conservation technique is rain water collection. 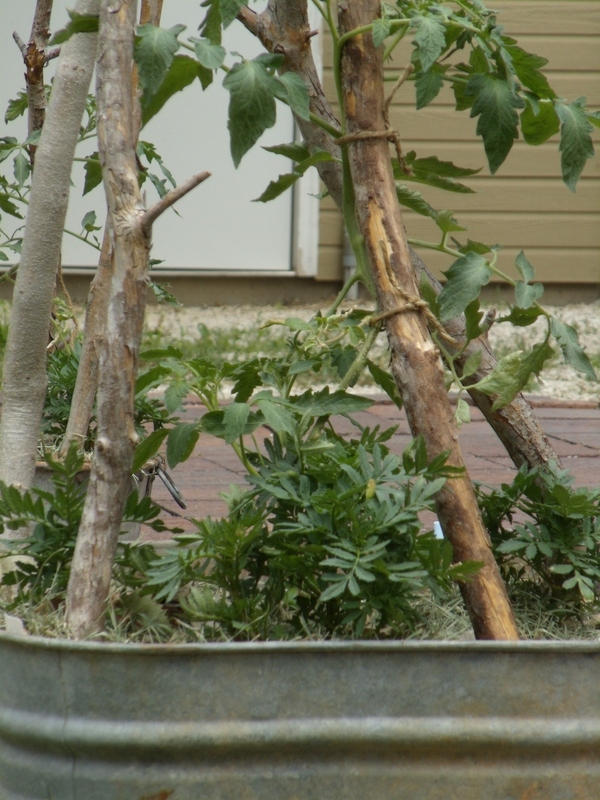 We have six rain barrels set up to collect rain water for use on the gardens. 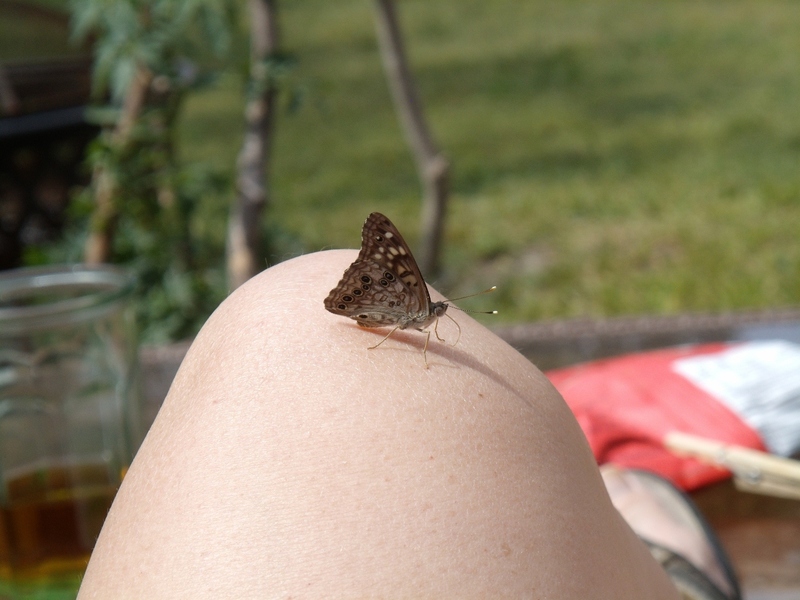 A sweet little ol’ butterfly made me its landing pad! 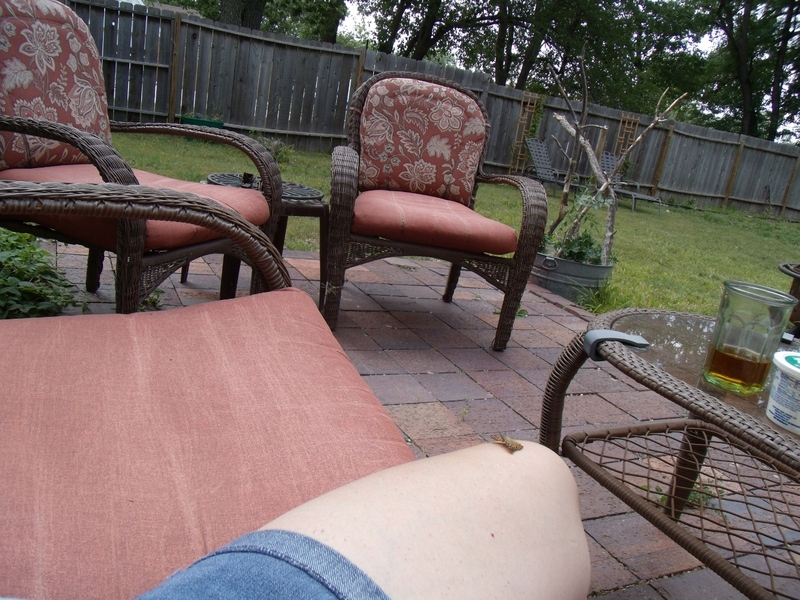 I was trying to take some stealth photos, but this creature could care less what I did – it was settled in for a thorough inspection. We like to give credit when it’s due, so here it is. 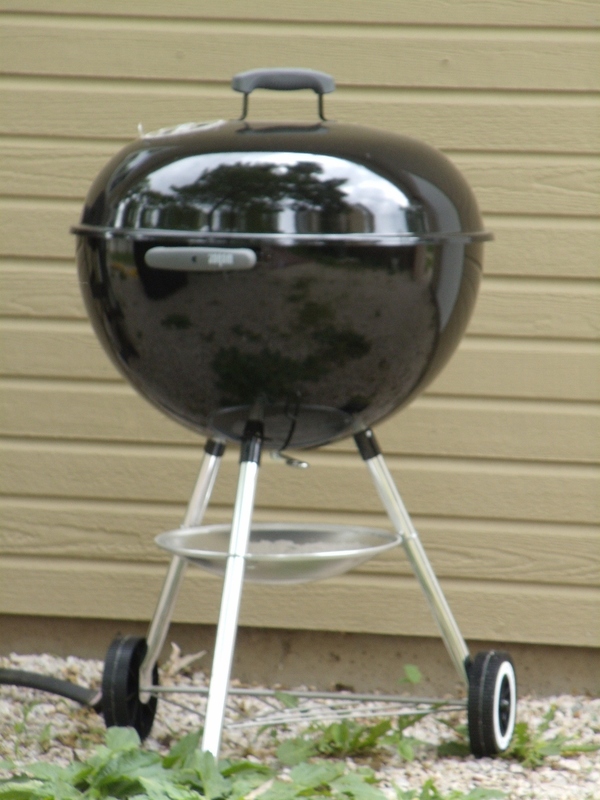 This little Weber grill has outdone any charcoal grill we’ve ever used (said lightly, since I haven’t used it yet). Hubby is the grill king, and he says it’s a winner! May is just around the corner. Time to get down to business in the garden. Today will be a planting day; the seed starts are stretching and yawing and need to go into the ground. The first leaky bucket I planted has not impressed me. The radishes have done very well – I’ve been harvesting them for salads – but the carrots and parsley are puny. The second leaky bucket has been a big winner. 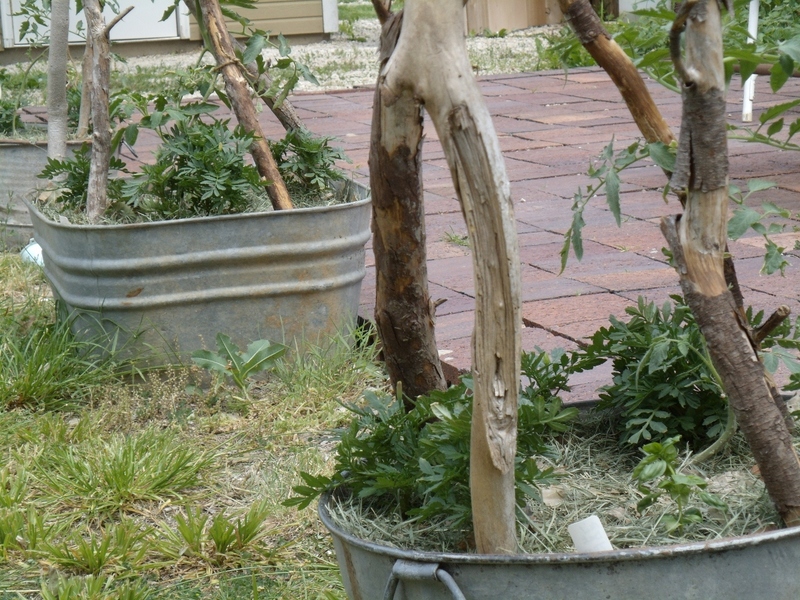 The main difference between the two buckets is that this second started off outdoors, two weeks after the first bucket was planted. The carrots in this bucket are giants comparatively! 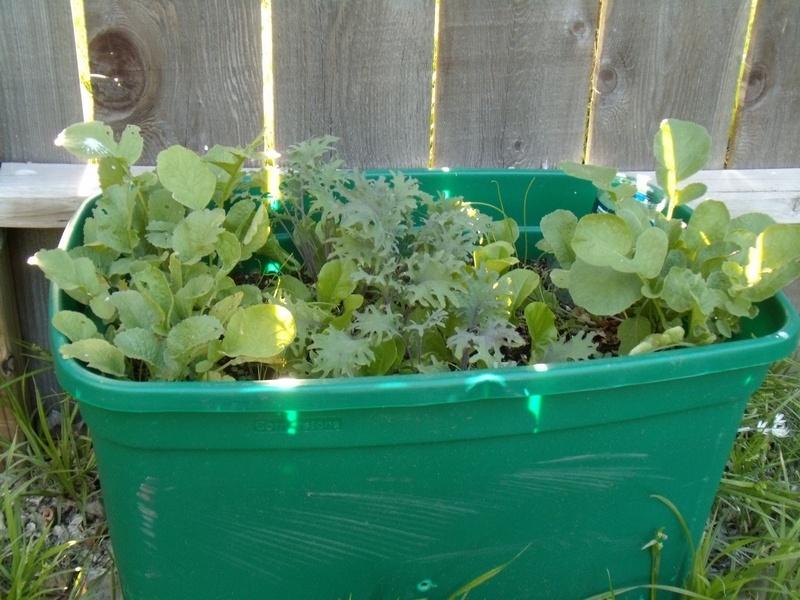 The self watering container is doing fairly well. 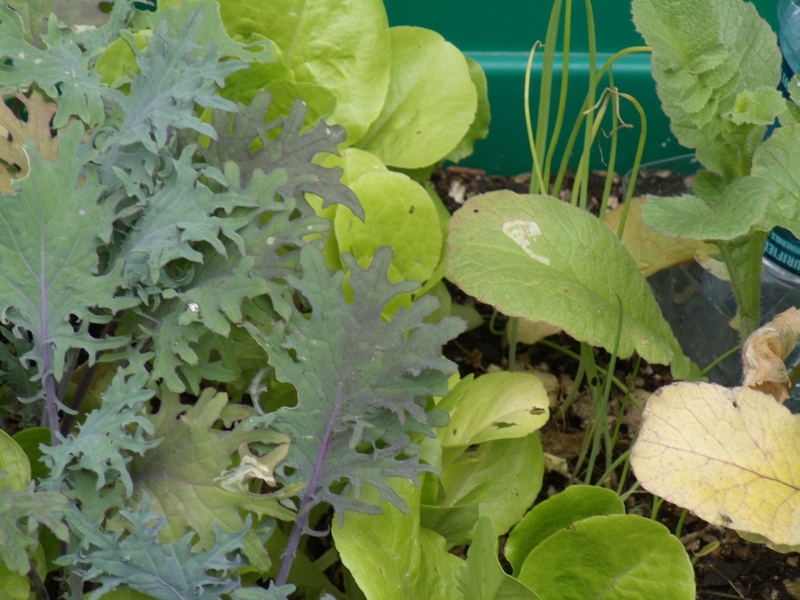 The kale and radishes look good, but the lettuce seems to struggle a bit. The onions are there, barely. The jury is still out on how those late seeded onions will fare. 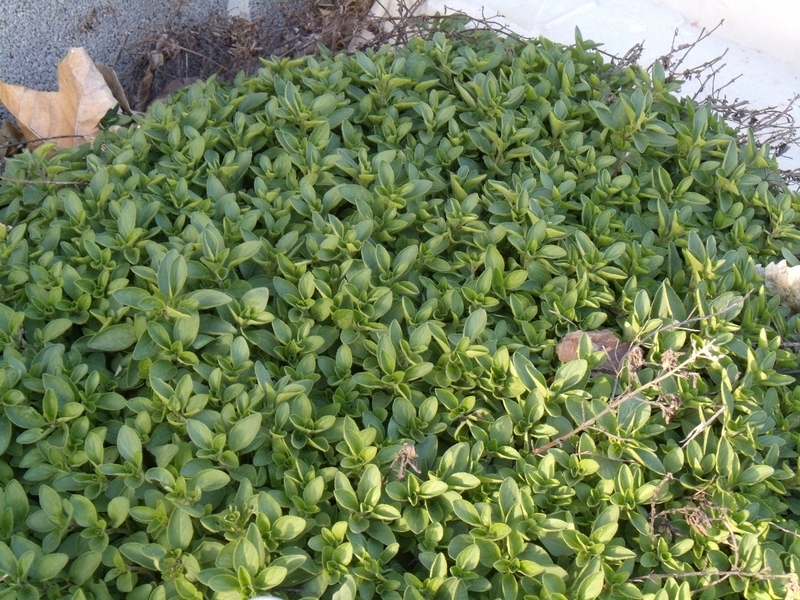 I have two separate oregano beds, one a lighter and more prolific type, and this type which is darker in color and has a more pungent flavor and smell (yes, I lost my labels and cannot recall what I planted). I like to mix them for a nice blend once the leaves are dried. 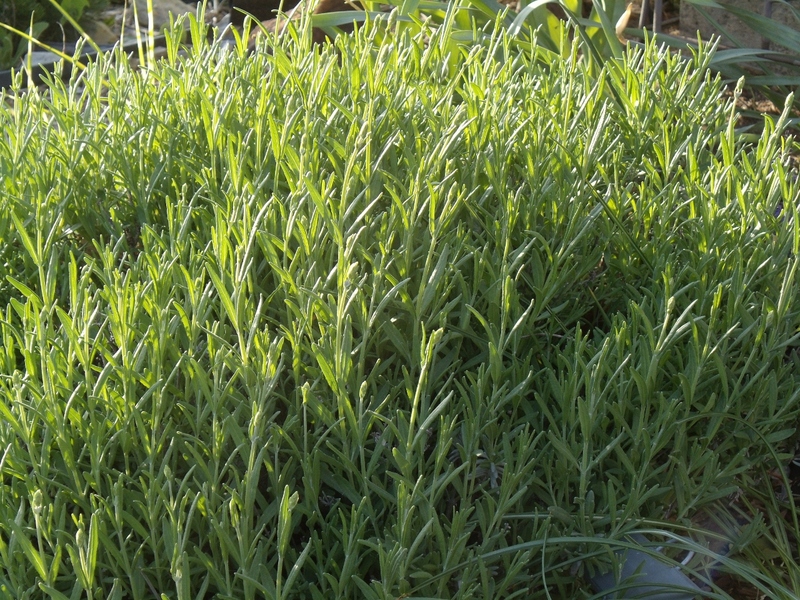 Lovely lavender is preparing to bloom. 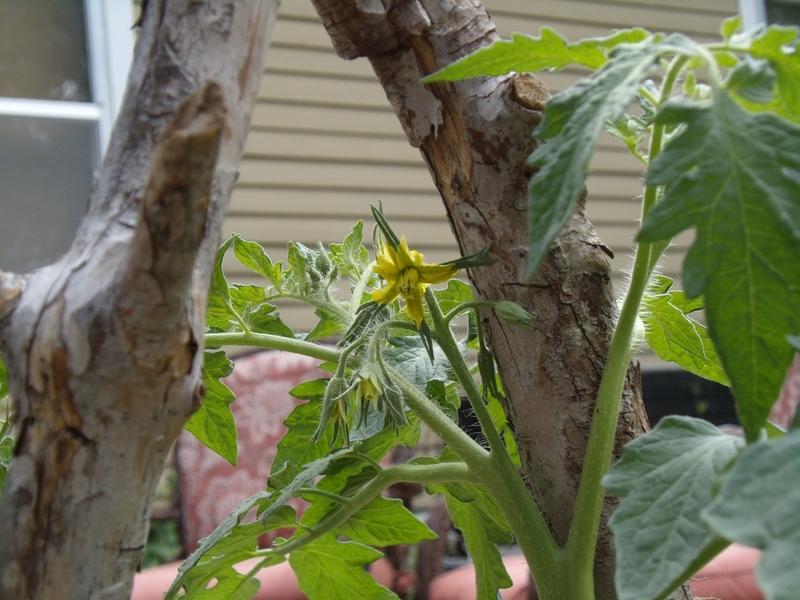 The bees will be oh, so happy! 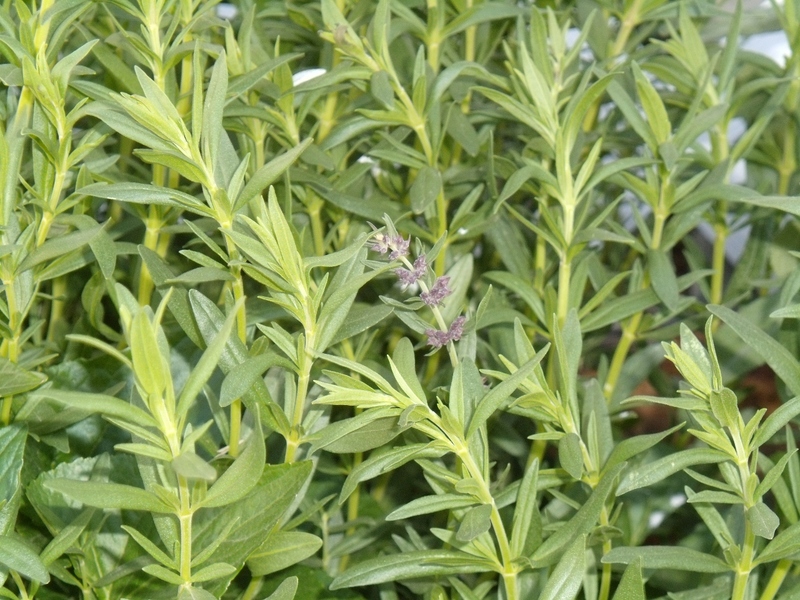 I have two lavender shrubs and have allowed them to get too woody, so will attempt lavender propagation this year. Here’s the first salvia bloom of the season. Purple is such a wonderful garden color! Tiny hyssop buds preparing to flower. I’ve read that hyssop was used a lot as an air freshener in hospitals, but I just don’t “get it”. Hyssop smells sort of skunky to me. 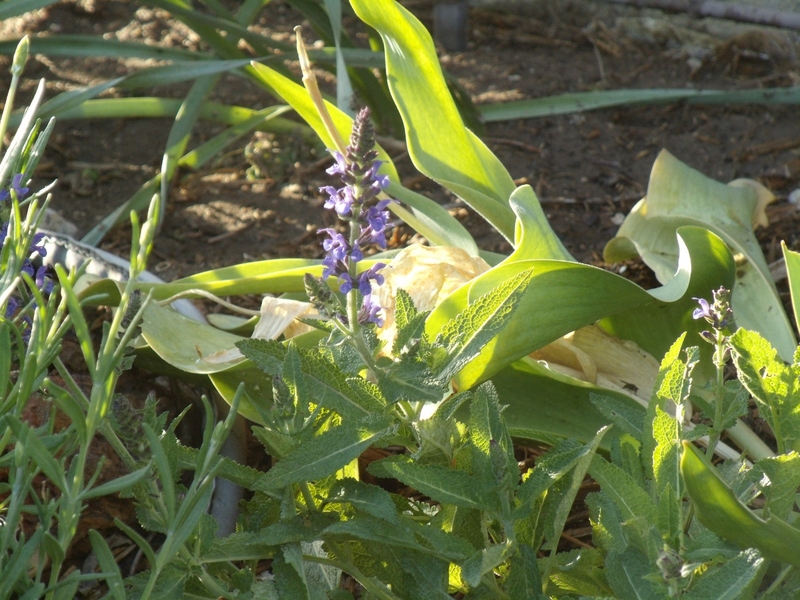 This is the rag-tag border, with wild violet and plantain. I see asiatic day flower crowding in as well – I’ll have to put a halt to that! I allow native invasives (yes, weeds, but beneficial weeds), but those day flowers are not welcome here. I set the rosemary out a bit early. We have had cool mornings lately and it’s a bit shocked by the change. 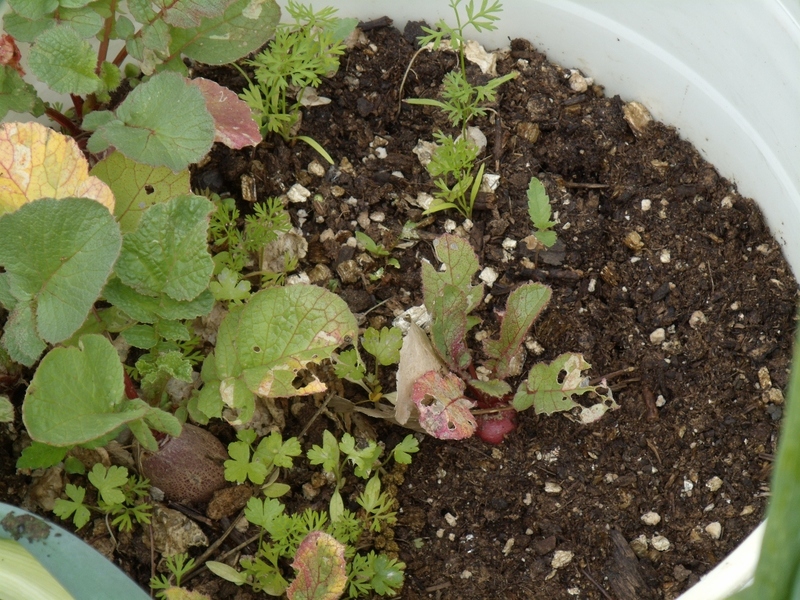 The walking onion container is my “mother plant”, which produced fifteen bulbs last summer. There’s the start. Now to get busy so I can get those poor leggy plants into the ground!